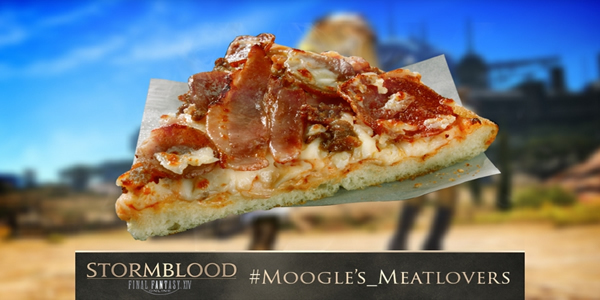 To celebrate Final Fantasy XIV: Stormblood, Dominos Australia has announced a new Pizza Mogul pizza, Chocobo Chow, and a gaming meal that includes a free download code for Final Fantasy XIV: Stormblood for PC and PlayStation 4. As for the Final Fantasy-themed pizzas, the first of these is called the Chocobo Chow. It has chicken, pineapple, capsicum, mushrooms, onions, and spring onion. The others are called Moogle's Meatlovers (BBQ meatlovers), Curious Cactuar (Vegorama), Stormblood Supreme (Supreme), and Heavensward Hawaiian (Hawaiian). In addition to the all-new creation, Dominos have renamed some of their most popular pizzas in celebration. To name a few, Moogle's Meatlovers (BBQ Meatlovers, Curious Cactuar (Vegorama), Stormblood Supreme (Supreme) and Hawaiian Heavensward (Hawaiian). You can check out more images on FFXIV4GIL and will be able to get Final Fantasy XIV Gil and FFXIV Power Leveling from here.